Frances graduated from the Fine Arts Program at Victoria College of Art in 2000. Her previous careers included education, librarianship and public service. Since graduation, Fran has exhibited in many solo, group and juried art shows in the Pacific Northwest. She received the Herbert Siebner Practicing Artist Award in 2005. Her public art commissions grace Royal Athletic Park and Gordon Head Recreation Centre. Her artwork is represented by Madrona Gallery in Victoria. Fran’s wealth of life experience lends a passionate intensity to her artworks. Her large scale, acrylic paintings focus on the drama of being human. They spotlight tumultuous emotions and intense experiences. In recurring themes, her subjects struggle with tension and strive for release. Moments of deliverance are fleeting, illusive and precious. The artist’s concern about personal freedom moves into the political arena in several exhibition paintings. A member of a human rights group, she personalizes the plight of the Palestinian people. These two paintings depict the beauty, then the burning, of Palestinian olive orchards during a land-use conflict. Above left, Baskerville painted the ancient trees with their gnarled trunks and silvery leaves from photos. She enlivens the rustling foliage with spontaneous brushwork and a lively palette of umber, yellow and green. “The orchards were a joy to paint,” she says. The deep reddish soil offers a striking contrast to the shining mottled canopy. Inside/Outside is a reinterpretation of Francisco de Goya’s The Giant (1810) in which a crowd flees an imposing and aggressive figure. In place of the giant, the artist shows a despondent Palestinian woman, seated with head in hand. The fleeing crowd, becomes the Intifada, a Palestinian uprising against Israel from 1987-1991. The ominous drama of the scene is conveyed through dark blues and purples amid swirling lighter areas. The small gestural figures in the riotous crowd are vigorous with intent. Baskerville is influenced by historic paintings by Goya, Giotto and Delacroix. “I’m attracted to the animated moments, strong diagonals and richly vivid colours,” she says. One of Baskerville’s daughters is a talented professional dancer who serves as model and muse to the artist. A stirring dance performance inspired this painting called All that Matters. Seeking to express the emotional experience, the artist used generous amounts of pigment, flowing freely and rapidly applied. Primary colours add dramatic accents. The closed eyes, facial tension and hunched posture add feeling to the artwork. This delightful portrait of three dancing figures includes one of Baskerville’s grandchildren. The artist uses bright colours and gestural brushwork to capture their joyful and spontaneous movements. The background melds together bright blue sky, sparkling ocean and tawny sand. Baskerville spent many summers in the Muskoka area while growing up. As a teenager, she worked in a resort in the area. This exuberant abstraction, boldly tactile with smears of bright pigment, suggests the singing beauty of silver lakes, green forests and summer warmth. Michel Matil is an artist living in Victoria whose colourful portraiture investigates metaphysical reality. Michel stands with Fran's six by six foot mural showing Palestinians scaling a wall to pray at a holy site in Jerusalem. Painted from a photograph, this mural was completed a few days before the opening. Michel is moved by the classical quality in Baskerville’s large work. “The balance of light and dark in the painting is impressive,” he says. The movement of men up the ladder to an unknown destination creates a sense of mystery. The viewer is engaged and drawn into the drama. A Little Lesson, by Fran Baskerville, 2014. Barbara Mitchell Pollock is a member of the Council of Canadians. She supports the mandate of the Independent Jewish Voices - to secure a just peace in Israel/Palestine. “There are many Jewish people like me who are critical of Israeli policies,” says Barbara. She believes human rights should be universal. Passing Through Storm, by Fran Baskerville is SOLD. 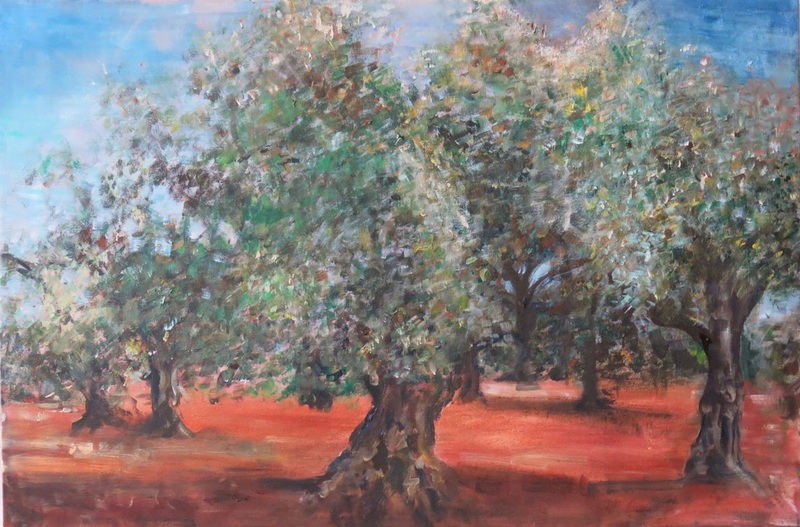 Destroying the Palestinian Olive Orchards by Fran Baskerville, 2015. Jenny Waelti-Walters attended the Victoria College of Art with Baskerville. Her connection with the artist continues in a shared critique group. “I’ve seen Fran’s painting evolve through various stages,” she says, “the latest being abstraction.” In Destroying the Palestinian Olive Orchards Jennifer admires the looseness and freedom of Baskerville’s expressive technique. “The composition is very good,” says Jenny. 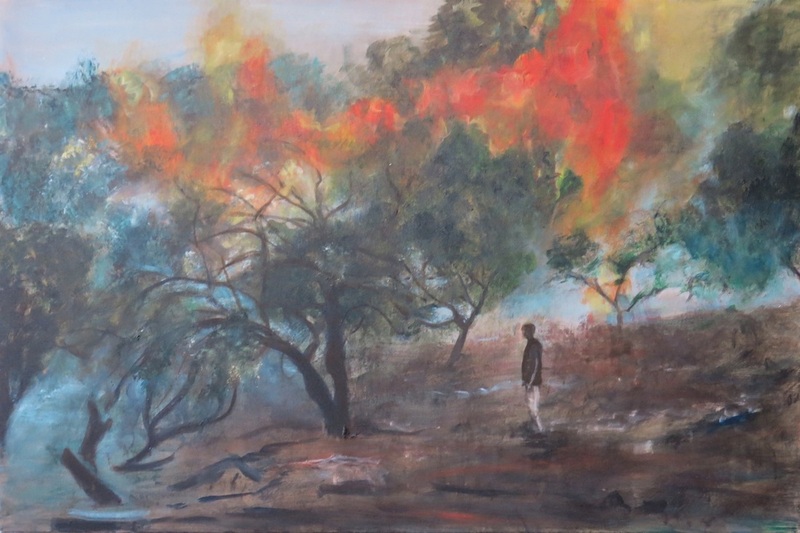 “This is a successful painting.” The fiery-reds and greens chronicle a raging forest fire; the lone figure adds a human touch to the tragedy. The artist’s strong social conscience is reflected in the theme, adds Jenny. Frances Baskerville welcomes your comments and questions about her artwork and sales. The Martin Batchelor Gallery is located at 712 Cormorant Street, Victoria. “Above and Beyond” award, hosted by Black Press.